Debbie presented at the 4th Annual Not Your Everyday Custody Case: Advanced Issues Facing Custody Litigators and Guardians ad Litem continuing legal education seminar on October 11, 2018. Over 100 people were in attendance. Debbie spoke on the many cultural considerations that impact custody cases. She discussed avoiding pre-conceived and unintentional cultural stereotypes, misunderstandings and biases that interfere with fairly applying the best interests of the children standard. Her presentation also included numerous practical tips for litigators and Guardians ad Litem involved in bi- or multi-cultural cases. Other topics in the seminar included assisted reproductive technology custody issues; effectively preparing clients; understanding therapy and evaluation options in custody cases; and technology in custody litigation. A panel of judges from three metro Atlanta counties also responded to questions. The 4th Annual Not Your Everyday Custody Case: Advanced Issues Facing Custody Litigators and Guardians ad Litem continuing legal education seminar is now available by webcast for 7 CLE hours, including 1 Professionalism Hour and 6 Trial Practice Hours at www.gabar.org. 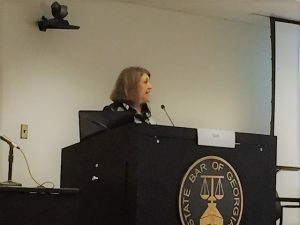 As Immediate Past Chair of the DeKalb Bar Association Family Law Section, in 2015 Debbie spearheaded, coordinated and co-facilitated the first seminar of this series. She has continued to contribute every year with the planning, and as a speaker. 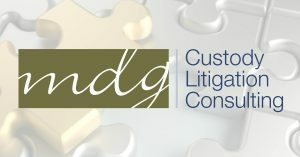 After years of being called upon to consult with attorneys in their challenging custody cases, Debbie has expanded her Guardian ad Litem practice by launching mdg Custody Litigation Consulting. Debbie prides herself on the quality litigation support services she provides for attorneys and their clients in custody cases. Independent Custody Assessments work to strengthen and cement client expectations, understandings and positive participation in the litigation process. Client Support and Support for Attorneys provide an added layer of comfort and support for attorneys and their clients in difficult custody cases. Debbie continues to be available to serve as a Guardian ad Litem in Georgia.